A low budget take on an American soldier's story in the latter days of the Second World War. Kaleidoscope UK R0 DVD. Written by the director Chris Grega, Rhineland is a little, low budget war film that never tries to overstretch itself. Instead the focus is entirely on the small mine-laying platoon and the tiny, really insignificant role they play in the war - no attempt is made to oversell the characters' importance or give them a war changing role. Grega's script is most remniscent of an episode of Band of Brothers and there is a decent attempt to give the soldiers in the platoon some distinct characterisation, although avoiding the clunky exposition or flashbacks of many other genre titles. In keeping with the realistic approach, there is no particular direction to the storyline and it can be somewhat unpredictable, the good characterisation of a lot of the soldiers makes it hard to know who will survive. Pacing is always strong with a good number of action scenes that are all relevant to the plot. As director, Grega's work is likely to prove rather polarising; he looks to the reflect the very personal nature of the film via the use of hand-held and close-up camera-work throughout - in the action sequences this works, giving the scenes an effective kinetic chaos, in the rest of the film it feels somewhat unnecessary and can get a little grating at times. To the film's biggest credit it eschews the modern trends for CGI blood and background effects and instead uses a historical re-enactment groups to provide extras and period vehicles, which even though used sparingly, aide the period feel enourmously - all of the film's occasional pyrotechnics and bloody effects are similarly pratical. A minimal soundtrack is used occasionally and provides decent backing. There are no well known names in the cast but among the lead cast the acting is reasonable. A few members of the supporting cast seem to be non-actors and there are some glaringly poor but fortunately brief performances - the background extras, provided by a re-enactment group, all seem quite convincing. 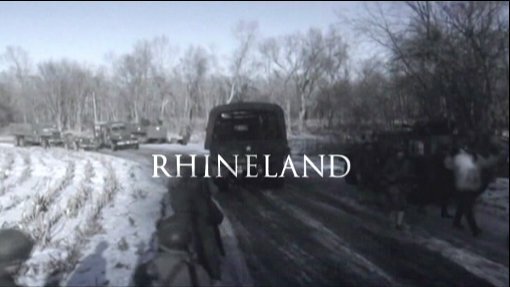 Despite typically bomabastic promotion on its DVD release, Rhineland is a very small scale war film, but it creates a highly realistic atmosphere - some might find the handheld camerawork outside of the action scenes to be unnecessary but at least the acting in the lead parts is okay and there is a high level of historical authenticity. Unfortunately a lot of watchers seem unable to look past the low budget production, but for those who can and particlarly for fans of series like Band of Brothers there is plenty to enjoy here. Any gore or violence ? Blood in the death scenes and one quite gory injury sequence. Who is it for? Fans of small scale, realistic war films should enjoy this. Looks to have been filmed on DV tape and subject to an NTSC>PAL transfer giving it a very pale colouring. Audio commentary with actors Derek Simmons, Paul Wendell and R.Travis Estes. Other regions? Released by VCI in the US. A neat little look at the Second World War from a very small scale perspective. A rather poor print transfer although always watchable. Audio commentaries are interesting but a documentary piece might have been easier to watch. All text in this review written by Timothy Young - 4th January 2015.